Brazil's economic uncertainty continues to worsen. 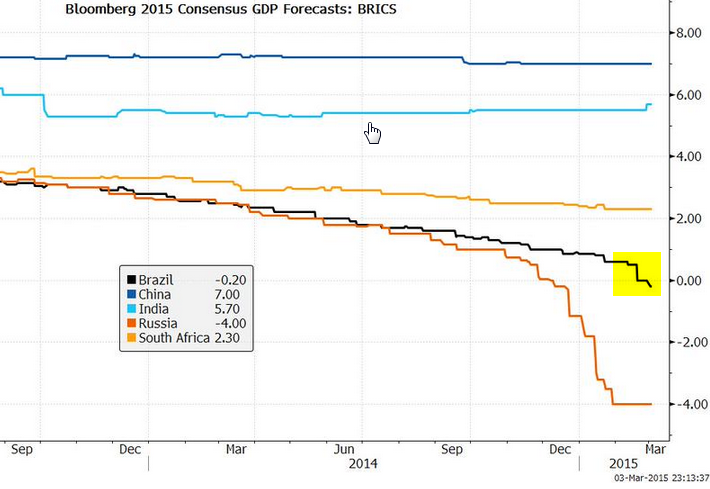 While growth projections for all the BRICS have been lowered, for the first time in years Brazil's economy is now expected to contract in 2015. We can see the impending recession reflected in the nation's inverted government bond yield curve. The fiscal situation has worsened materially. 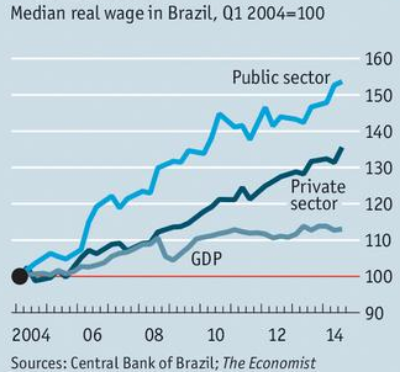 As the Economist recently pointed out, wage growth of public sector employees is unsustainable. The government is now forced to undertake significant austerity measures which will hit the economy hard. Years of mismanagement have come home to roost. With fiscal risks on the rise, the nation's sovereign CDS remains elevated. 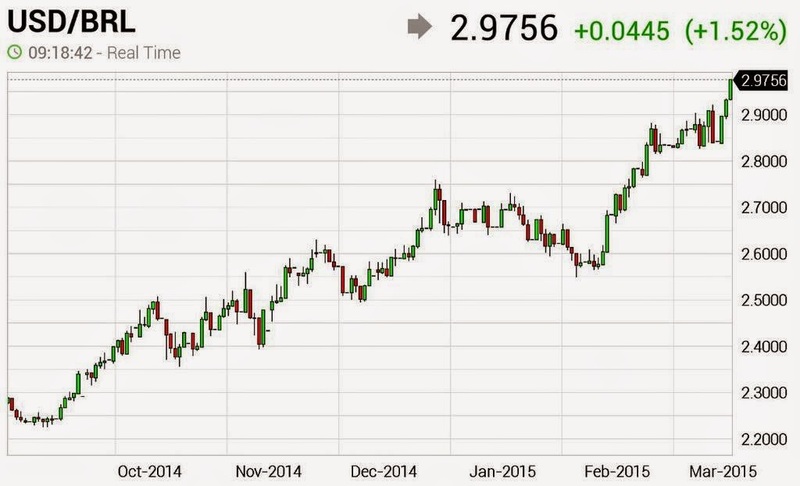 The Brazilian real hit new lows not seen in over a decade, as the economy struggles. Furthermore the Petrobras scandal as well as its potential impact on state banks (who are massively exposed to the firm's credit risk) weigh on the currency. As the currency depreciates, the nation's dollar denominated debt is becoming increasingly burdensome. Some may remember this headline from 2013. That $11 billion was 24.5 billion reais in 2013 and now it's 32.8 billion. The company's liabilities have increased by a third while the assets have been hurt by weaker energy prices. In response to the currency weakness Brazil's central bank hiked rates to the highest level since 2009 to stabilize the currency and fight rising inflation. This will further dampen credit demand and accelerate the recession. Now all we need is for the Fed to hike rates. 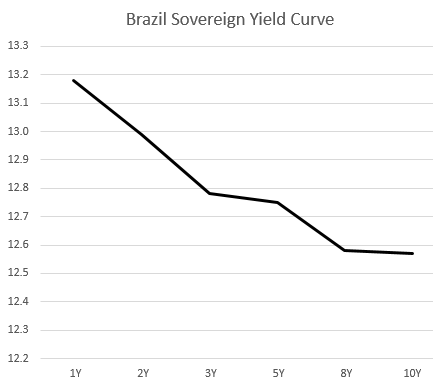 That will put more downward pressure on the real and force Brazil's rates even higher. As it is the 10-year government bond yield is already above 12.75%. It's important to point out that given its significance to the global economy, Brazil's problems can spread way beyond its borders. 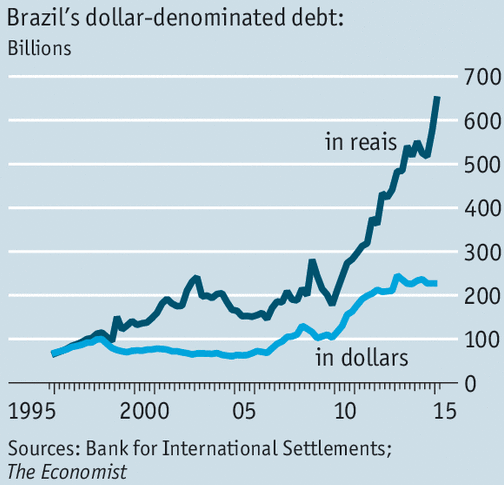 The Petrobras scandal for example has shaken other Latin American debt markets (see story). 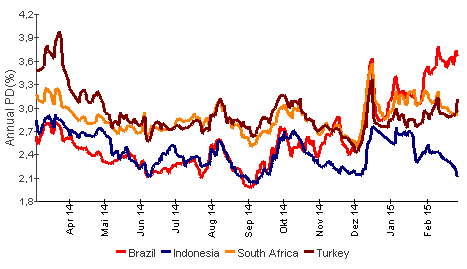 The currency weakness in Brazil is now pressuring some international commodity markets. The nation's growers of sugar, oranges, etc. can dump commodities at lower dollar prices and still come out ahead in domestic currency terms. 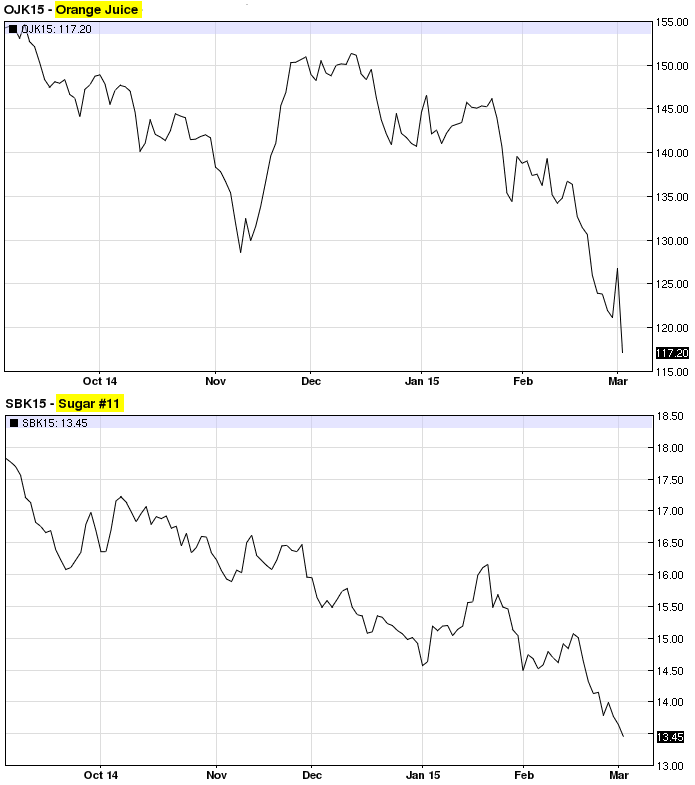 As a result orange juice and sugar futures have fallen sharply (May-15 contracts shown below). A number of other commodity markets will be impacted as well.